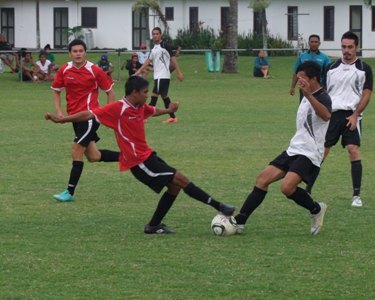 On Friday, Sokattak disposed of Takuvaine red devils by three goals to nil in the first semi finals of the 2012 CIFA Knock-out competition. Sokattak scored their first goal mid way through the first half through their winger Conrad Piri, after the goal keeper tried to defend the shot which deflected off his gloves and into the goal. Sokattak’s second goal was struck beautifully by Teariki Mateariki into the far left upper corner after some fancy footwork to get past two of the Takuvaine defenders. In the second half of the match, Sokattak went on to score one more goal with a beautiful header by young Irangi Mauri. Although Takuvaine had two goal scoring opportunities, their strikers failed to convert these into points. Nikao Sokattak booking their knock-out final spot against Lotto Premiership holders Tupapa Maraerenga. In the second and final semi final of the Premier Men’s match, Tupapa Maraerenga eliminated the young side from the west Arorangi by six goals to nil. Central defender school teacher, Mr. Delaney Yaqona scored for Tupapa Maraerenga only after ten minutes of play with a well timed header from a corner kick. Ten minutes later after Arorangi created two scoring opportunities of their own, however a loose ball from almost 30 yards out saw Grover Harmon score the second goal from a low but powerful laced strike with the Arorangi goal keeper, John Vano having no chance in blocking the shot. In the second spell of the match, the young fit Arorangi outfit hassled the Tupapa’s momentum but just couldn’t add the final touches to convert their opportunities into goals. Tupapa added four more goals, one from a free kick from Grover Harmon, two penalties from the boot of Rhys Ruka and Aminesh Prasad and a soft goal from substitute Campbell Best. In the first of the senior women’s semi finals last Thursday Titikaveka and Nikao Sokattak were scoreless after full time with a result of nil all. Penalty shootout took place to decide the winner with Titikaveka coming out on top in advancing to the finals. In the second of the semi final for the senior women’s division, Tupapa Maraerenga easily eliminated the wild wild-west girls from Arorangi by seven goals to one with Kim Tare an import from Vaipae, Aitutaki scoring five goals which is a record for a woman in a single match.